A vegetable unjustly disdained by those who know only the tough, bitter, overgrown junk available in the supermarkets (well, arguably it is just for such folk to disdain it), it should thrive in our locale, though timing is the key to success. The species likes a fairly long growing season that is cool when the sprouts themselves start to develop (indeed, like many cool-weather crops, it actually needs some frosting to attain its proper flavor). Also: whatever you do, don’t prepare them by boiling them; roast them, stir-fry them, braise them—just don’t go all English-cooking (”boil ’em till they surrender”) with them. This is another item with a fairly large number of variants, each—as always—being “the best,” none with reliable taste information available. And almost all the touted kinds are hybrids; open-pollinated sprouts are—in North America, though not in Europe—almost lost. But, since the home gardener really can’t save Brassica seed (owing to potential disease-transmission problems), we will live with a hybrid choice. There are two cultivars that seem outstanding for the home gardener: Gustus, which we will try this year, and Dimitri for next year. We will repeat here what we now say about all Brassicas. For a long time, we made the mistake many amateur Brassica growers make, that of trying to race against summer with cool-weather crops. Even with fairly early plantings, if the crops don’t mature very quickly, the weather gets warm then hot, and your sprouts (or other Brassica) crop is largely or wholly shot. A lot of sources insist that sprouts should be started indoors as seedlings. But they are talking about spring-planted sprouts, which, as we said above, seems a useless fight against nature. If we are summer-planting for late-autumn harvest, for us the seeds will go in the ground in early August, which is scarcely a time when one worries about poor l’il seedlings getting frosted down. So, obviously, we direct-sow. For our exact climate, we will be seeding on August 8th. The nice thing about fall harvest is that we don’t need to be too exact about dates, because the plants can go pretty deep into autumn and early winter. Gustus is listed as 99 days, which means harvest should be able to start in mid-November, but we can keep going on till, well, till almost forever. One source says “In colder climates, Brussels sprout plants should be pulled out of the soil before temps drop below 10 degrees F. in the late fall”—but our average overnight low never gets that low (again, average low); another source said “I let some Brassicas overwinter last year and all of them lived through several nights in the teens and highs below freezing”; and tales of gardeners stomping through snow drifts to pick sprouts are common. What a change from spring planting! Plant seed ¼ to ½ inch deep. These fellows need some room: even in a deep-dug bed, an 18" spacing is wanted. Be sure to plant a few seeds at each spot, then then to the hardiest as they come up. Brussels sprouts are generally treated like broccoli or cauliflower and suchlike brassicas. They are largely indifferent to soil type (from sand to clay), though they do need well-drained soil. But: Several sources suggest planting in soil that has not been enriched with any nitrogen source (apparently, sprouts in high-nitrogen soils grow gangbusters, but are too busy leafing and stemming to bother setting sprouts). They want regular and generous watering (brassicas in general like having wet leaves, so water freely). Again: Keep firmly in mind that sprouts that have not been exposed to one or more pretty solid freezes are nearly tasteless. This is most definitely a late fall—or even winter—crop! Keep it going as long as you can—it might well continue bearing right through the winter, snows and all. Commercial gardeners remove all leaves to accelerate harvest, but that practice is not essential in the home garden. 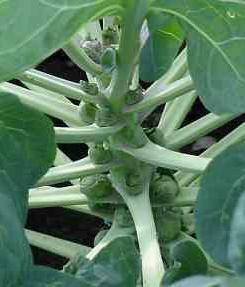 Some gardeners believe that the sprouts develop better if the lowermost six to eight leaves are removed from the sides of the stalk as the sprouts develop. Two or three additional leaves can be removed each week, but several of the largest, healthiest, fully expanded upper leaves should always be left intact on top to continue feeding the plant. Another commercial practice is “topping”—pinching off the growing tip of the plant when the sprouts are present but immature. Some sources say that is not critical for home growers, but others swear that it is utterly essential for good production. If you want to go that route, figure on doing the topping about three weeks before your harvest is to begin; for us, that would be around October 24th. Once plants begin to set sprouts, they can become a bit top-heavy and could be prone to wind damage (or even be blown over). Many suggest staking the plants or hilling up soil around the stems to support them; we, who get very high winds at times, have never had any problem with unstaked plants, but there it is. As the sprouts come ready, harvest them from the bottom up, which is how they mature (the all-at-once harvesting of agribusiness is one reason store-bought samples taste so bad). Keep them picked—they’ll grow more. It is a brassica, a member of the Cruciferae, closely related to cabbages, and nearly as closely to broccoli and cauliflower. Though sprouts were cultivated in Italy in Roman times, and in some form by possibly as early as the 1200s in Belgium. Brussels sprouts in the form that we are familiar with today were first cultivated in large quantities in Belgium (hence the name “Brussels” sprouts) starting somewhere around 1587. Brussels sprouts were introduced into the U.S. in the 1800s. By the 1900s, they were being grown commercially in California. Brussels sprouts are the 23rd most-popular vegetable in New Zealand. On the other hand, they kill and eat sheep. It was last modified on Monday, 28 January 2019, at 21:20 EST.